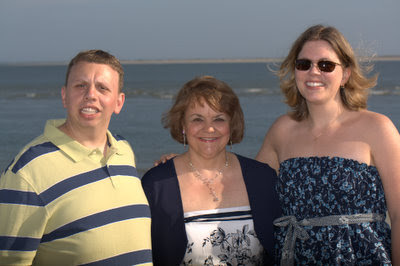 Megan and I had a great time in South Carolina, getting to spend plenty of time with my Mom and Brother. My dad was back in Ohio-he's been having chronic abdominal pain and didn't make the trip. No fun. One of the things that I try to do when I first arrive at a new place is to take note of the first bird species I see. 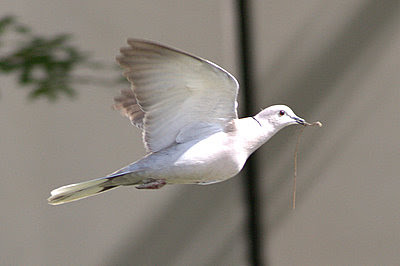 On Saturday morning, the first bird was a Eurasian collared dove. While we were waiting for 50 ridiculous minutes for our shuttle van to pick us up, I watched this bird make several trips from its oak tree nest to a flower bed. 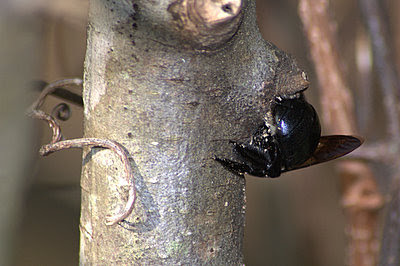 It would carefully look for the right type of material, and then it would fly down the airport pickup road and fly up into the tree. We had flown into Columbia, S.C. as it was much cheaper than leaving Columbus. And we flew from Dayton, probably right over Abe Lincoln's house! 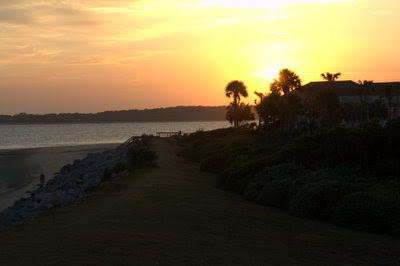 After a two hour drive to Seabrook, we picked up our condo keys and headed to the place. The neighbor had parked his car in our driveway, which caused somewhat of a ruckus- we couldn't park in the driveway. We called security, etc. etc., the guy moved his car. 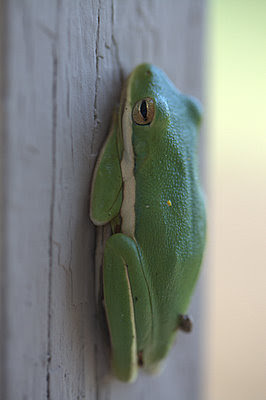 All the while I noticed this green treefrog sleeping on the railing o f the entrance stairs to the condo. 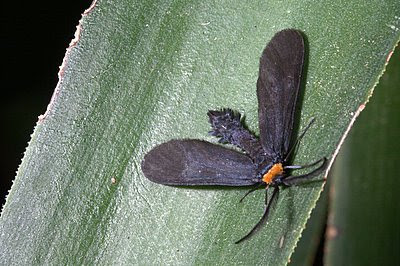 What an awesome creature. More on these later. So we arrived about two, and I had a few minutes to photograph whatever was around the condo. 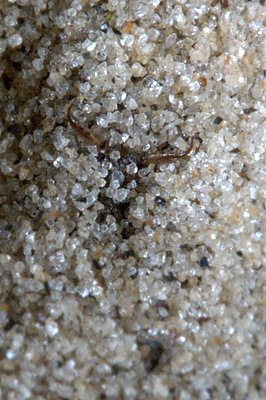 Can you see the ant lion? Then, it was off to the wedding, held at 6:15 on Friday evening. Best of luck to the bride and groom, Amy and Jason! 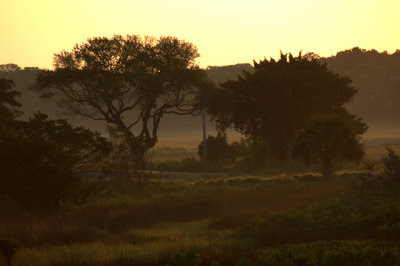 ....and after a rousing good party, I woke the next morning to see the sun coming up behind the palm trees, golf course, and salt marsh, looking to the east. 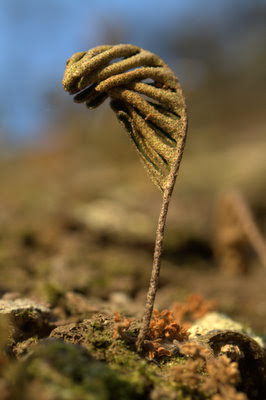 Some type of resurrection fern? 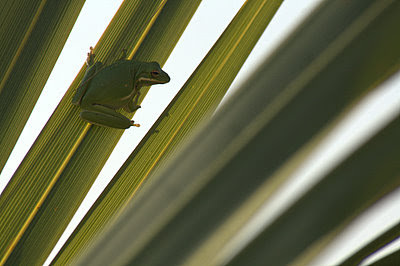 The tree frogs were basking in the early morning sunshine. 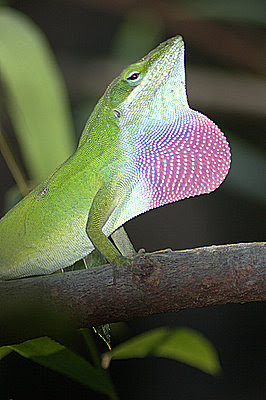 And the male anoles were flapping their dewlaps to woo female anoles. And this bee caught my eye. 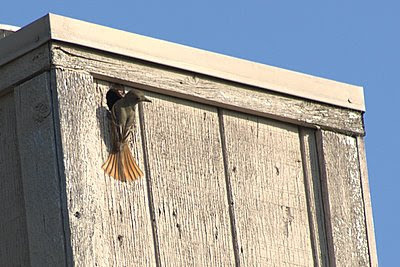 And a great-crested flycatcher was nesting next door- in a cavity built right into the side of the condo. 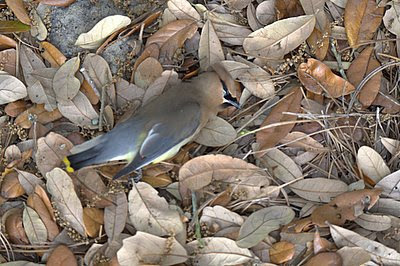 And to end on a sad note, this cedar waxwing crashed into the condo next door, and I saw it flutter down, land in the soft pine straw and live oak leaf litter, and breathe its last breaths! How sad. What a beautiful bird. 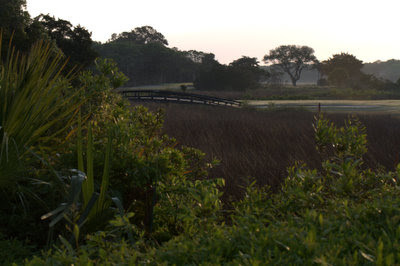 And that was our Friday and Saturday morning on Seabrook Island! 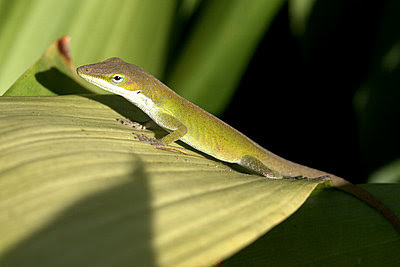 Wow...the frog and anole pictures are great! Looks like you had a good time. Tom: You really had some great photo opertunities during your trip. 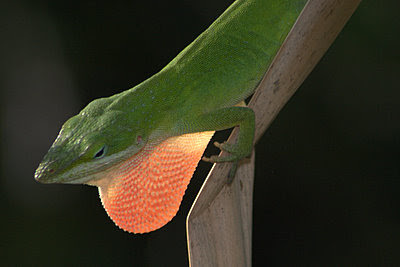 There are just to many to choose a favorite but I liked the lizard shot. What a whirlwind trip. I didn't see any of those frogs! I really like the pictures of the dove and the frogs. I have seen too many dead Cedar Waxwings this year. They seem to have more difficulty with windows than most birds. 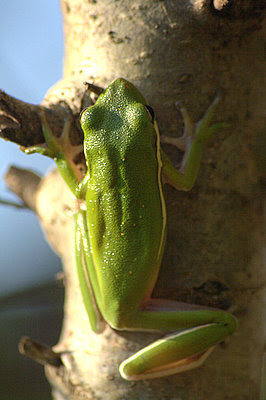 Wow your Tree Frog photos are splendid! That looks like a great place, full of photo ops! Too bad about the Waxwing - I agree that they're such lovely birds. Wow, such beautiful shots! What a trip! Tom, looks like you had such a wonderful time in South Carolina! 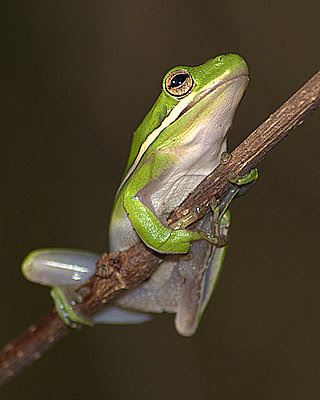 I love all your photos but those Tree Frogs really made me smile! Glad you felt much better on this trip! Mary- thank you,the trip was a whirlwind! Almost like a dream. Guy- thanks very much. 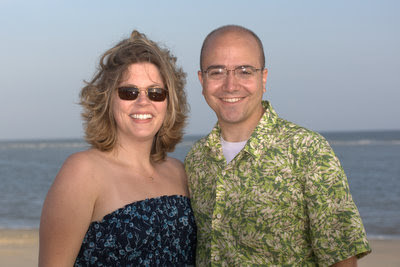 The island was a fantastic place to visit. Megan- Yeah, no time to point them out to you...I didn't want to wake you. Ruth- Thank you...that is strange, I wonder why. Adam- Yeah, they are really fantastic, and the island was great. I took advantage of every photo op I had. And TOM- YES, YOU ARE SO RIGHT! I laughed out loud when I read your comment. 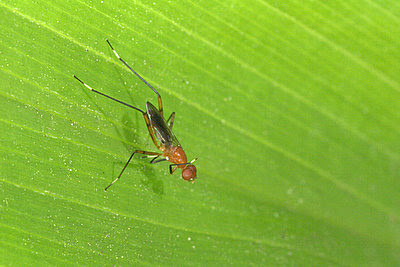 I was SO sick in Florida, it was ridiculous.